The song of the week is 'Cherokee Shuffle' in the key of A. Notice that: a) the 5 chord is played for the entirety of the 7th measure of the A-Part, rather than just for the second half of the 7th measure; b) the B-Part starts with the 4 chord, and alternates between the 4 and 1 three times; c) the B-Part is ten measures long instead of eight; and d) the second to last measure of the B-Part is split between the 4 and the 5 chord. Cherokee Shuffle is closely related to the key of D fiddle tune 'Lost Indian', but unlike Lost Indian, Cherokee Shuffle has an unusual form. 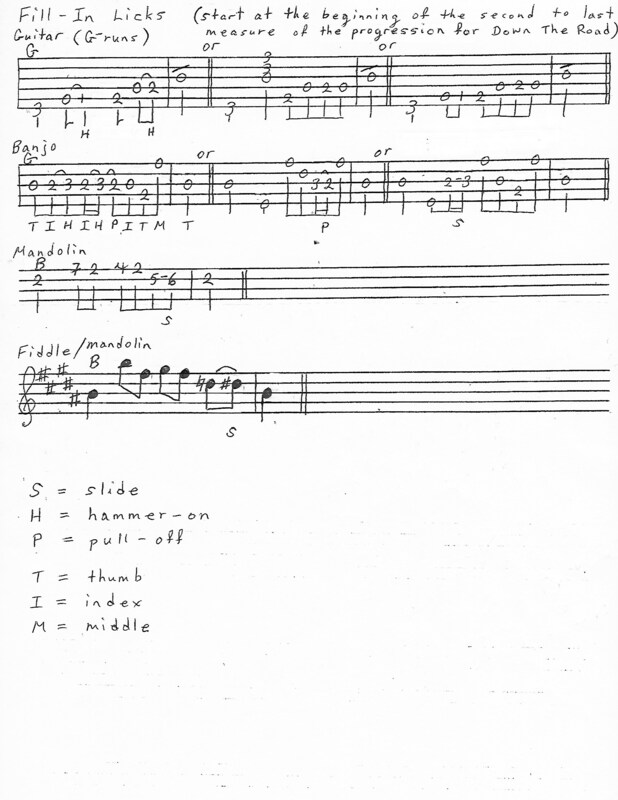 The B-Part of Cherokee Shuffle is 10 measures long instead of the usual 8 measures that make up a part in a double reel. The A-Part of Lost Indian is essentially the same as the A-Part of Cherokee Shuffle. The B-Part of Lost Indian uses the same progression as, and a similar melody to the A-Part. In some versions of Lost Indian, the B-Part is little more than the A-Part melody played an octave higher. 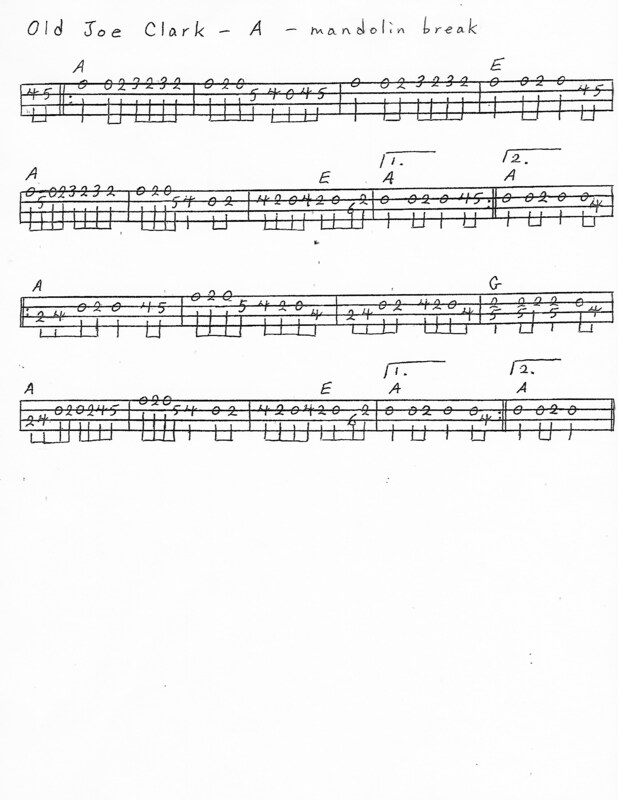 Cherokee Shuffle is one of the relatively few AABB-type fiddle tunes that I prefer not to start with an 8 potato intro at a jam, because the first melody note of the first measure is identical with the main note I would be droning in an 8 Potato intro (in the key of A, an A note that is in the same octave as the A note that the melody begins with), thus making it sound unclear where the intro ends and the tune begins. So, I start with three quarter note pickups instead that ascend into the A note (E, F#, G#: the 5th, 6th, and 7th notes of the A Major Scale.) Other tunes like this include Buffalo Gals, Salt Creek, and Red Wing. 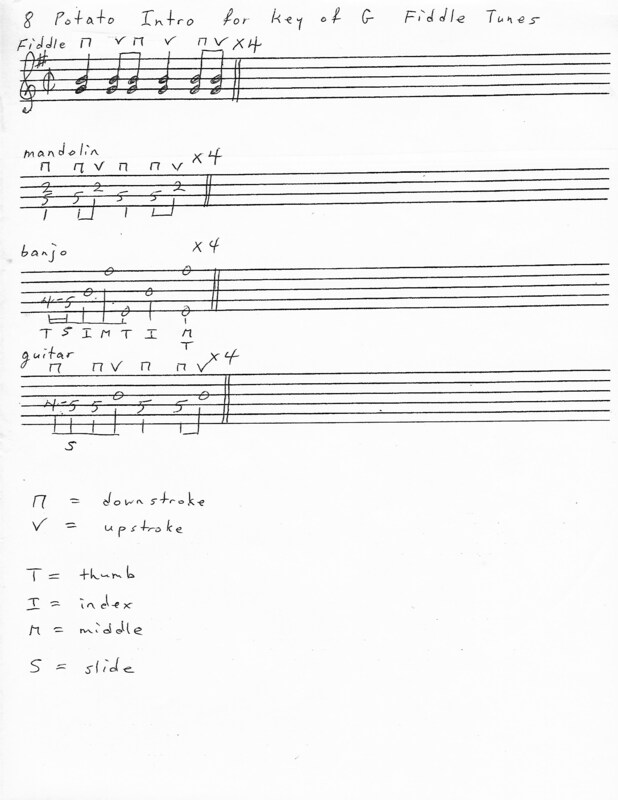 The first four melody sheets attached here are just one of many hundreds of differing printed versions of the melody for Cherokee Shuffle. Most, but not all, of the alternate versions available fit just as well with the chord progression I have given for Cherokee Shuffle, so feel free to mix and match as you like the different versions you may know or may come across, but, in doing so, keep the chord progression in mind. 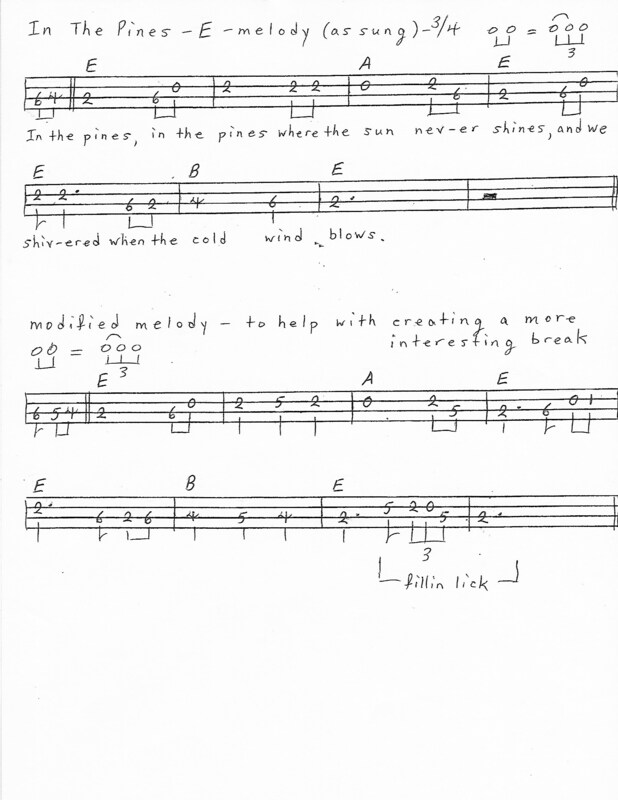 Although the melody sheets contain far more 8th notes than most other song of the week melody sheets, please remember that these sheets give only the melody (or rather, a melody); they are not full-fledged Bluegrass breaks, they provide you with nothing more than just a good starting point for creating such breaks (compare the melody sheets with the breaks you hear on the youtube links provided here, and notice the kinds of embellishments that are used in these breaks that are not represented anywhere on the melody sheets). 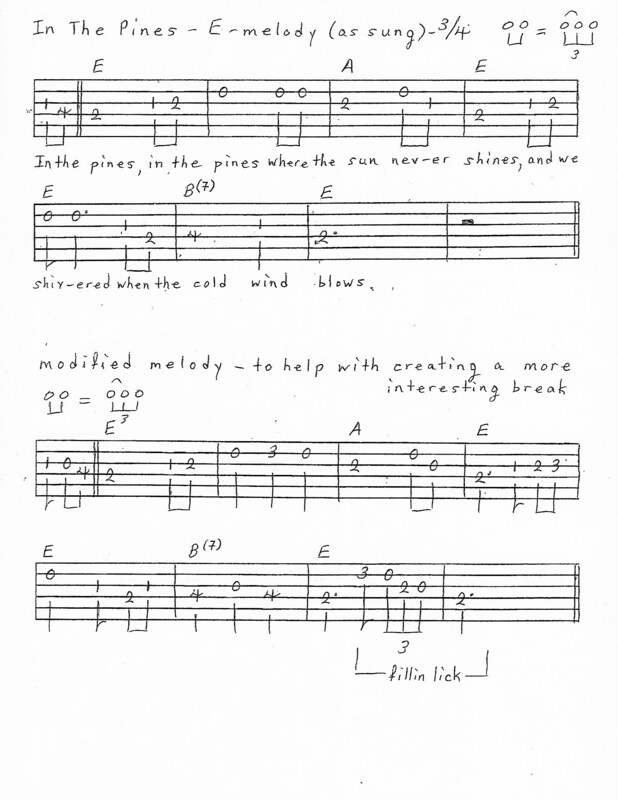 Of all the melody sheets attached here, the fifth melody sheet has the least in common with a bluegrass-style break. It contains far too many consecutive quarter notes, and no embellishments are given for any of the many half, dotted-half, and whole notes. Most songs played at Bluegrass jams with a 6m chord in their progression could be played without the 6m and still sound musically correct, and Cherokee Shuffle is no exception to this. Although I don't think I have ever heard anyone play it like this, it would work to use the 4 chord in place of the 6m, because the main melody note in the 6m measures is a note that is part of both the 6m and the 4 chord (an F# note in the key of A.) F#m, which is the 6m for the key of A, consists of the notes F#, A, and C#. The D major chord, which is the 4 for the key of A, consists of the notes D, F#, and A. The 6m chord shares two notes in common not only with the 4 chord, but also with the 1 chord. For this reason, when the 6m chord occurs in a progression for a song, it is common to be able to find other versions of the same song in which, depending on what the melody notes are at that point, either a 1 chord is used instead or a 4 chord is used instead. For instance, some versions of Will The Circle Be Unbroken (Prog. 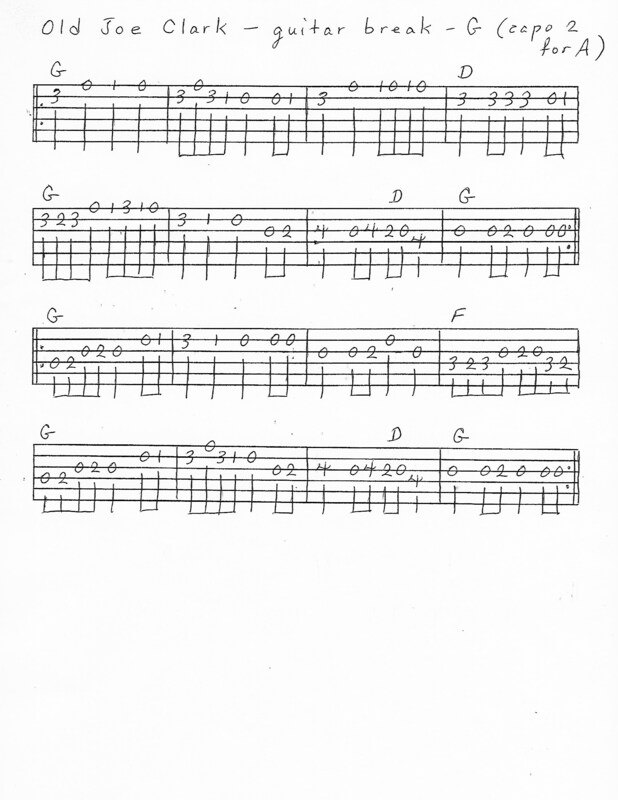 V3 on the Basic Chord Progressions handout) use 1116m, or rarely 116m6m, in place of 1111 for the third line. At every bluegrass jam I can remember playing Sitting On Top Of The World, 116m6m was used for the third line, yet on all the old classic bluegrass recordings of the song that I am familiar with, that same line is played as 1111 (Prog. V3). In a previous incarnation of the beginner jam, Lonesome Road Blues was often played with 4416m for its third line in place of 4411 (Prog. W4). The Clumsy Lovers, the 'Raging Celtic-Bluegrass-Rock' band originally from Vancouver, BC that I have been a member of since the Spring of 2001, uses 6m511 for the last line of Amazing Grace in place of the much more common 1511 (Prog. V6), and 4416m in place of 4411 for the third line of You Are My Sunshine (Prog. V4). At Bluegrass jams, the B-Part of Big Sciota is typically played as 155446m51, but at the Old-Time jam held at Pengilly's on Tuesday nights (right across the street from where our Wednesday and Thursday night jams are held), they usually play 6m in place of 4 and 4 in place of 6m, thus reversing the order in which the 4 and 6m occur in the progression: 1556m6m451. When Down In A Willow Garden is made the song of the week for the jam in the near future, it will be played at the jam with only 1, 6m, and 5 chords. But you will hear on some of the recordings that will be sent out in the song of the week email for the song the 4 chord being played in some of the spots where I have put the 6m in the progression. Notice the similarity of the progression for the A-Part of Forked Deer to the progression for the A-Part of Boil The Cabbage Down and for the B-Part of Soldier's Joy. For some versions of the melody of the B-Part of Forked Deer, the first line of the B-Part would more appropriately be played as: 5 5 5 5/1. Jason Homey & The Snake River Boys - key of G (first break, verse, and chorus in 3/4; remainder of the song in 2/2); starts at 5:16. The song of the week is 'Angel Band' (3/4 time) in the key of Bb. Notice that:1) this progression (like the progression for 'Silent Night') consists of six 4-measure lines, for a total of 24 measures; 2) the progression starts with the 5 chord; and 3) the last third of the progression (lines 5 and 6) is the same as the middle third (lines 3 and 4) of the progression. When I lead Angel Band at the jam, the song will be played with full-length verse progression breaks, rather than with just the one-line turnarounds that are played for breaks on the recording. 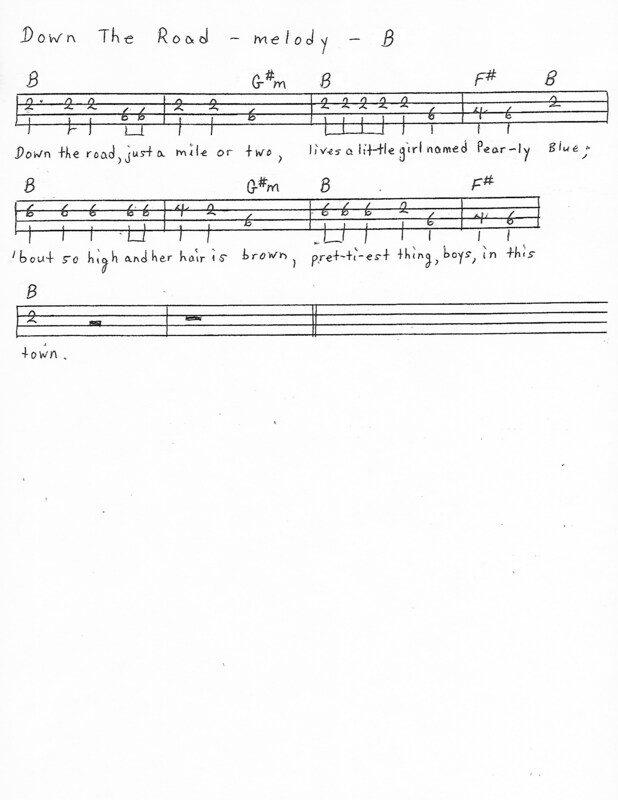 To indicate that the chorus starts with the 5 chord it is a good idea to play a two quarter-note ascending or descending run on the last two beats of the measure that comes right before the first measure of the chorus, and the same may be done as well to lead into the second line of the chorus, since it also starts with the 5 chord. Attached here is the set of handouts for April - June 2019 for the Intermediate Jam, which includes two versions of the new song list that we will play from for the first half of the evening: a large print list that gives the names of the songs without the progression used to play them, and a smaller print version that includes the chord progressions for the songs. 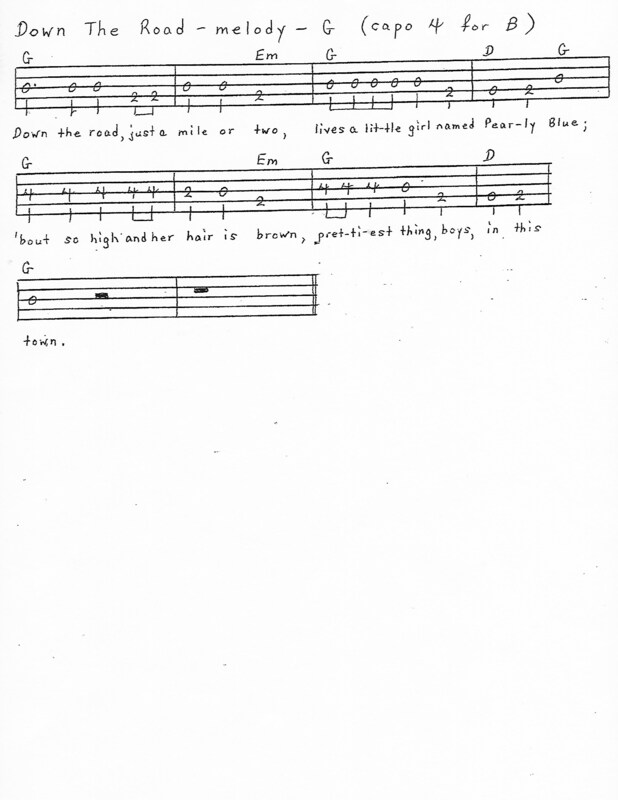 No changes have been made to the Basic Chord Progressions handout, or to The Nashville Number System chart. Beautiful Brown Eyes - key of G - played in 2/2 (cut common) time rather than in 3/4. This song will be counted as a 'recycle', because it was a song of the week for the 2017-2018 beginner jam, of which the 2019-2020 intermediate jam is the continuation. The song of the week is 'Old Joe Clark' in the key of A. My intentions in revisiting 'Old Joe Clark' as a song of the week for the intermediate jam are: 1) to provide an occasion for people to review the breaks they have been playing for the most frequently played fiddle tunes at the jam to see if there is anything in their breaks that could use some 'updating' in accordance with the level of playing ability that they have now attained; and 2) to continue where we left off at when Liberty and Turkey In The Straw went through their song of the week cycles in terms of working on increasing the tempos at which the jam group is able to successfully play standard fiddle tunes. The breaks given in the attachments are not as busy as most of the breaks on the recordings provided below, but if you combine the two breaks together, using most of the busy spots in each, then the resulting breaks will come close to some of the breaks heard on the recordings. However, in view of the tempos at which Old Joe Clark will be played at the jam, be careful about how many notes you try to put into your breaks all at once. Note: the way that many people, myself included, play the F chord-shape on the guitar looks very similar to the fingerings used for the C chord-shape. So, if you are following a guitar player for the chord changes for Old Joe Clark while at the jam, it can be helpful to keep in mind that there is no '4' chord in the progression. A quick way to determine what the b7 (flat-seven) chord is for any given key is to think of it relative to the 1 chord. The b7 will always be one letter lower and one whole-step lower than the 1. Make it a point to remember this. It is called the b7 (flat-seven) chord because the root note of the chord is a half-step lower than the 7th note of the Major scale (flat means a half-step lower). 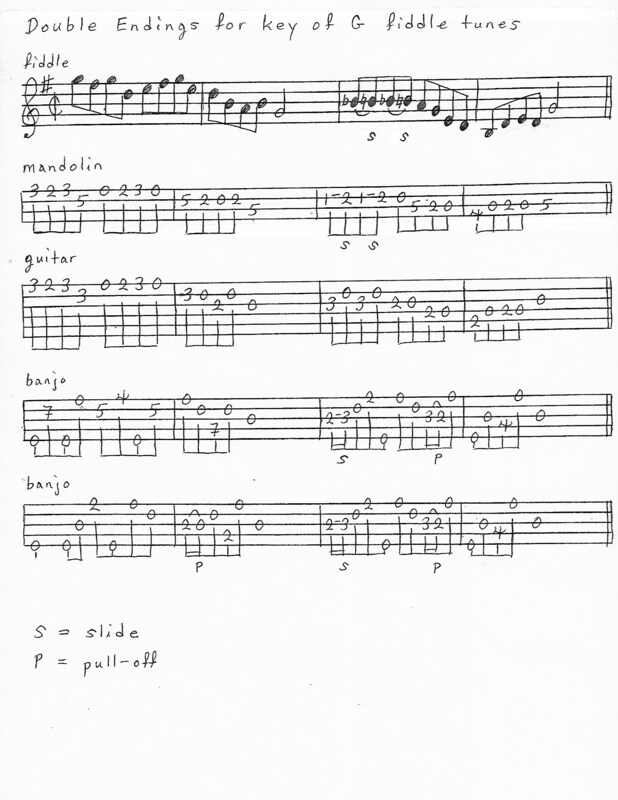 E.g., The G Major Scale consists, in order, of the notes: G, A, B, C, D, E, F#. The 7th note of the G Major Scale is therefore F#. 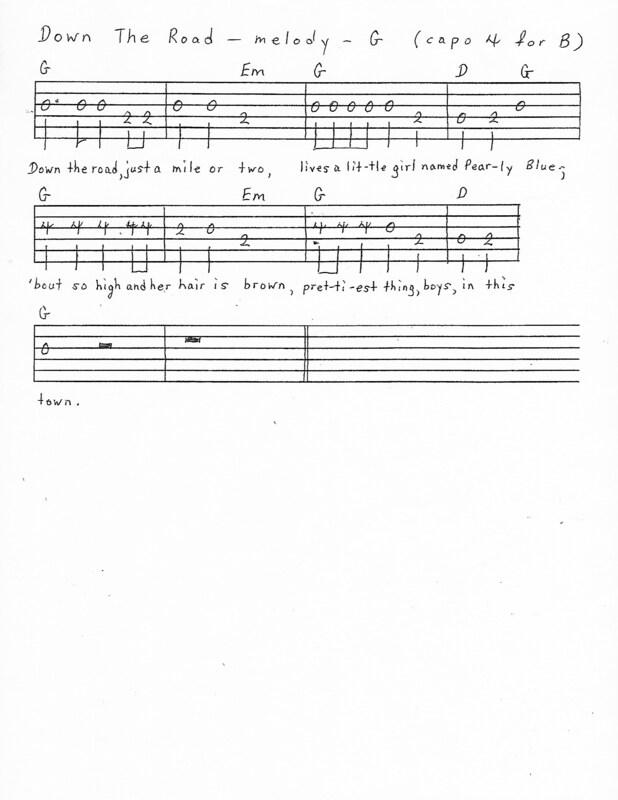 The note that is a half-step lower than F#, and uses the same letter in its name as F#, is F. Therefore, in the key of G, the b7 chord is F.
The melody of the tune is based upon the mixolydian scale. This scale, which shows up frequently in the traditional music of the American South and the British Isles, and in Gregorian Chant, is in all respects like the major scale that we are all familiar with (do-re-mi-fa-sol-la-ti-do), except that the seventh scale degree ('ti') is lowered by a half step. The result is that a mixolydian scale always has one less sharp (or one more flat) in it than the major scale that shares its same letter name. Since the A major scale has 3 sharps (F#,C#,G#), the notes of the A major scale being, in ascending order of pitch: A B C# D E F# G# A, the A mixolydian scale (like the D major scale) has 2 sharps (F#,C#), the notes of the A mixolydian scale being: A B C# D E F# G A. Since the G major scale has 1 sharp (F#), the G mixolydian scale (like the C major scale) has no sharps. 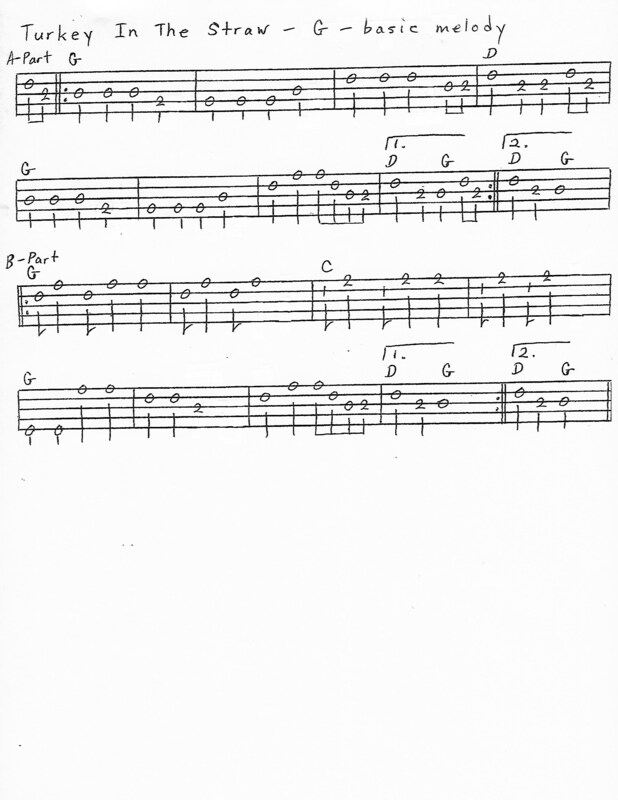 The G major scale is: G A B C D E F# G. The G mixolydian scale is: G A B C D E F G.
The most effective way to kick-off most AABB-form fiddle tunes, including Old Joe Clark, at a jam is not by playing a pickup measure consisting of three quarter notes to lead into your intro break, but is by droning in a straight but rhythmic manner the root note of the key that the tune is in (often together with another one of the notes that also belong to the 1 chord) for four measures to lead into your intro break.This is called in bluegrass and old-time circles the '8 Potato Intro'. It is also customary in Bluegrass circles to end most AABB-form fiddle tunes (as well as most fast instrumentals) with a tack-on 'double ending' that is played, not in place of the last 4 measures of the tune, but rather immediately after the last measure of the tune has been played. 'Double' refers to the ending being 4 measures long rather than only 2 measures long. 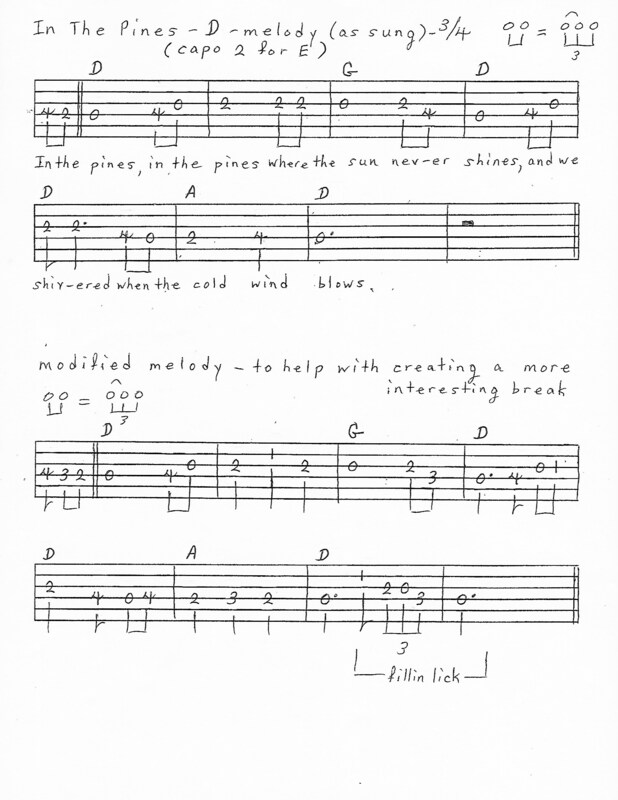 Most of these types of endings consist of two 2-measure length ending licks played back to back. https://www.youtube.com/watch?v=vDt4RvFrdmQ - key of Ab on the recording, because all the instruments were tuned up a half-step higher than standard. 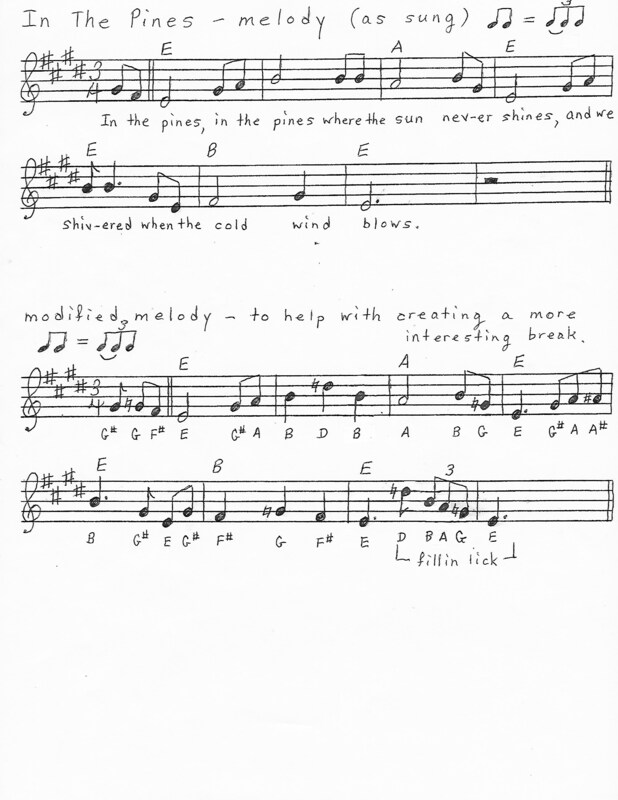 The song of the week is the old-time fiddle tune 'Turkey In The Straw' in the key of G. The melody sheets attached here show the form (AABB) and chord progression for the tune. Here is an excellent Bluegrass performance of Turkey In The Straw to listen to: some pretty advanced playing going on here at a relatively high speed (in excess of 140 beats per minute) for a fiddle tune played with so many melody notes per measure. 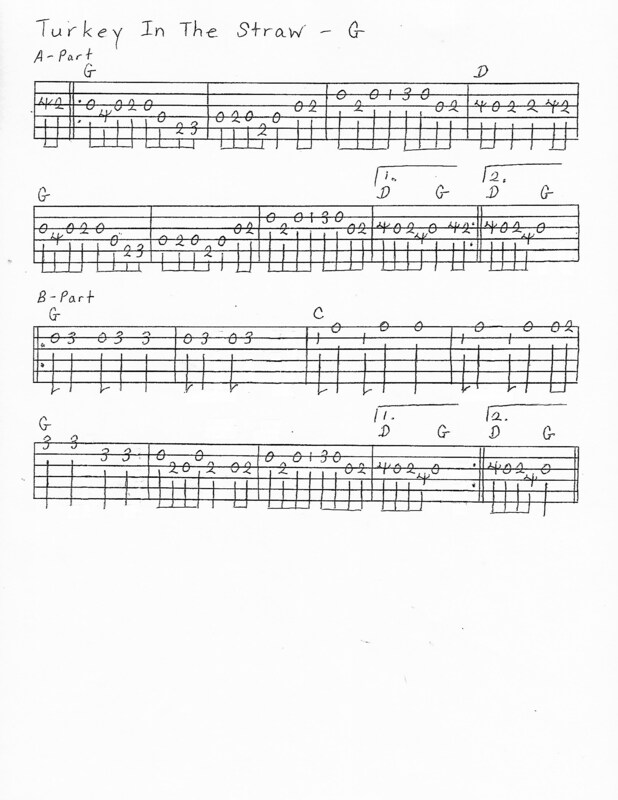 The melody sheets attached here for fiddle, mandolin, and guitar do not require anything to be added to them to make intermediate level breaks for Turkey In The Straw. They contain a good balance of quarter and 8th note, and very few of the melody notes are lingered on long enough to lend themselves well to the typical Bluegrass embellishments. 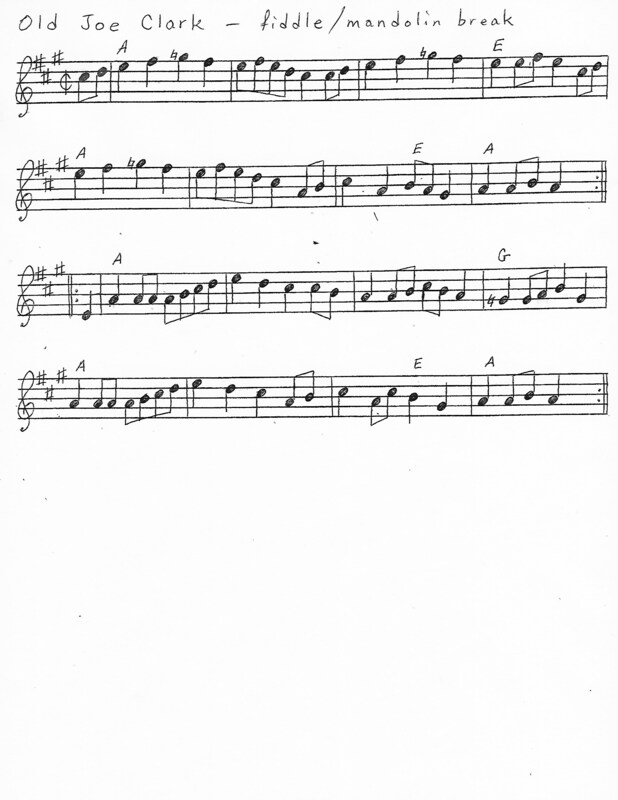 The version of the melody given here, played as is as a break, is suitable for an intermediate level player to work with for getting his playing on the tune up to speed. Aim to get up to 120 beats per minute. (2 clicks, not 4 clicks, of the metronome per measure). While you may need to eliminate a few notes here and there at first in order to be able to play your break up to speed, be careful not to take too many notes out: otherwise, your break will start to sound more like a beginner level break rather than an intermediate level break. With enough repetitions through the break, isolating and looping the passages you find most difficult, paying attention to your right and left hand technique, seeking to eliminate any and all unnecessary motions of the fingers that could slow you down, and pushing your speed with the help of a metronome, your ability to play at faster tempos will improve. 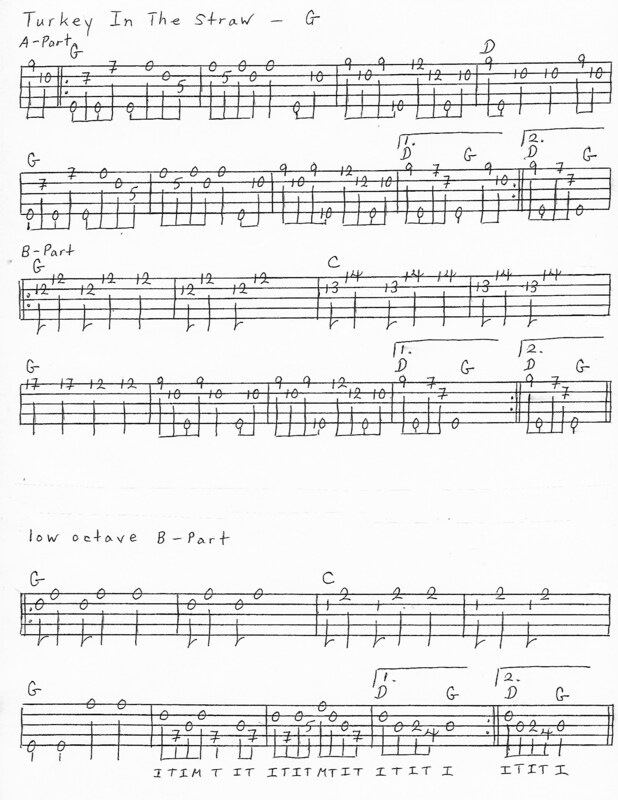 The first banjo tab attachment contains almost all the same notes that are given on the melody sheets for the other instruments. 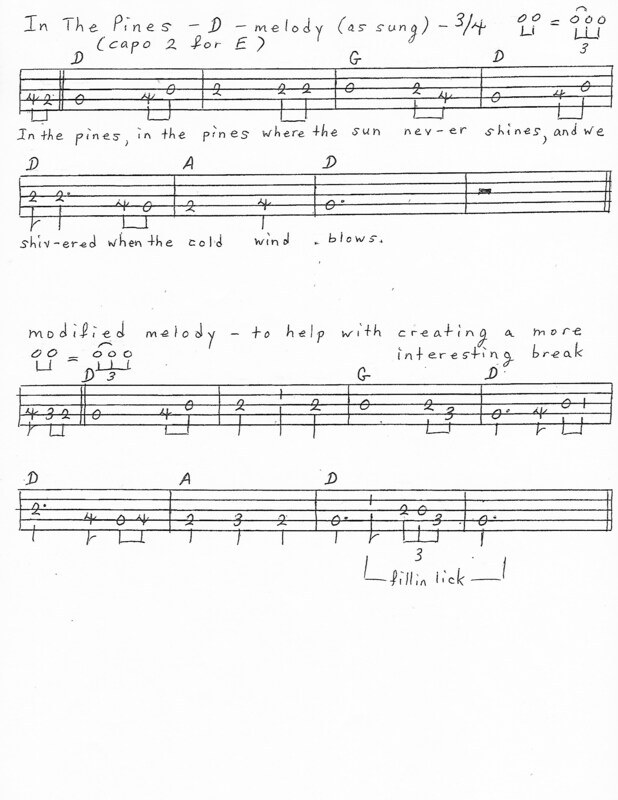 It is a melodic-style arrangement. 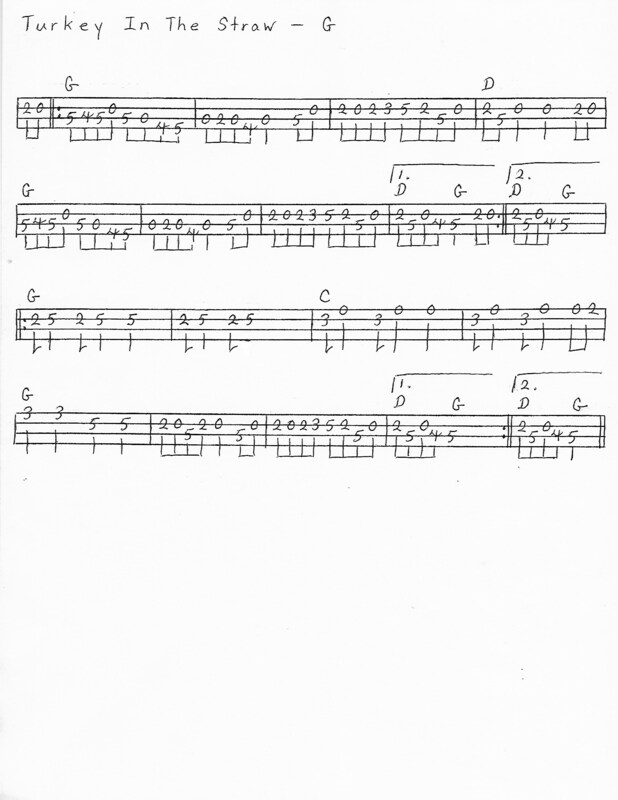 Unless you already play in melodic style, I recommend referring instead to the second banjo tab attachment which contains a skeletal version of the melody that can be used as a guide for creating a Scruggs style break by putting rolls and left hand techniques (slides, hammer-ons, pull-offs) around the most essential or main melody notes of the tune. Also in the attachments is a chart of 8 potato intros and double endings that will work well for Turkey In The Straw, since the use of these types of beginnings and endings are the most effective ways to begin and end most fiddle tunes at a bluegrass jam. Since it is crucial to get a tune off to a good solid start, for this affects how the whole song will be played, be sure to practice not only your 8 potato intros, but also the transition from the 8 potato intro into the beginning of your break. 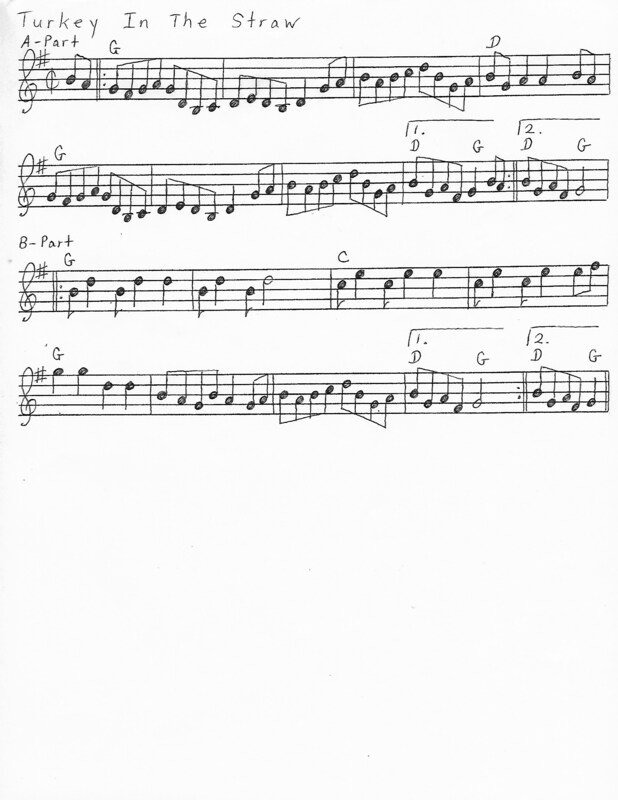 It is important to be aware that if you choose to begin your break with the two 8th note pickups written on the melody sheets, you will need to play these in place of the last quarter of the last measure that makes up your 8 potato intro, otherwise your timing will be off and the tune will get off to a bad start. In practicing 'tack-on' endings (e.g., the double endings given in the attachments) that are played after the last note of the tune proper, be careful to hold the last note of the tune for exactly the right length of time before starting into the ending. And the same goes for the last note of the first half of a double ending. For otherwise, your timing will be off, and there are few things more anticlimactic at a jam than people being out of time with each other in playing their final note or chord for a song. For Turkey In The Straw, this means, among other things, that the last melody note played needs to be held as a half note before starting into the double endings given here. 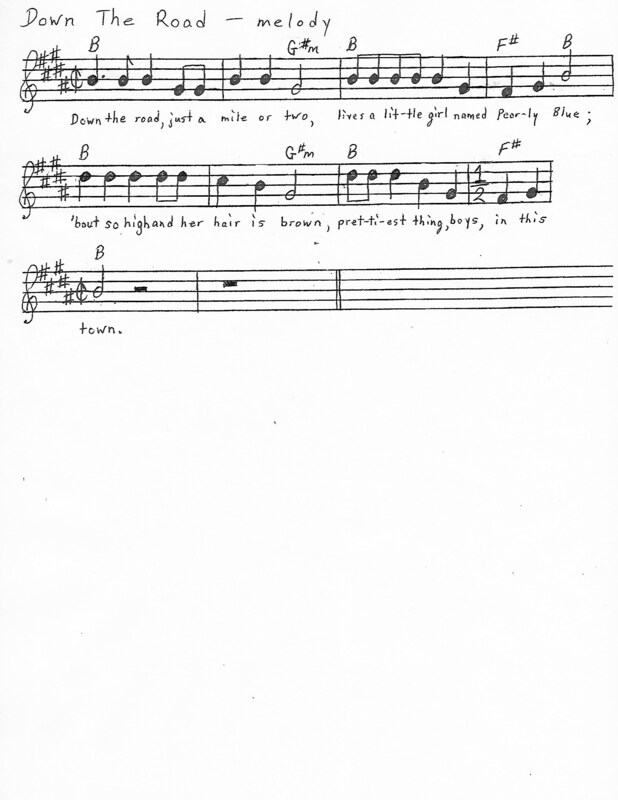 The reason why this melody note is written on the melody sheets as a quarter note instead of a half note is simply because the melody sheets show how long the last note would need to be held if one were to go into the beginning of the break again after playing the last note. They do not show what needs to happen in order to transition into a tack-on ending, for no tack on endings are given on the melody sheets. For figuring out the timing involved in going from an 8 potato intro into the beginning of a break, and the timing involved in going from the end of a break into a tack-on ending, just remember that, with the exception of specific spots in 'crooked' tunes (e.g., Down The Road, Clinch Mountain Backstep), all measures of a song, from the first full measure onward, need to be of equal duration.